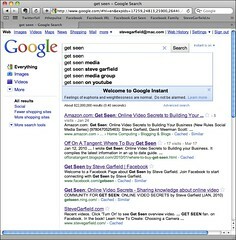 Search Engine Guide > Mike Moran > Are you keeping up with Google? It was only recently that a number of critics were talking about how Google is standing still and Bing is the real innovator in the search space. I think that Google Instant has quieted those critics, at least for now. Love it or hate it, Google Instant certainly is innovative and it is not the only thing going on at the Googleplex. We previewed it a few weeks ago, but it is happening for real now: Your page design matters for your SEO. But I am not sure that's even the biggest Google change of recent vintage. So, Google Preview will get a lot of attention, as it should. It is a big change to the way searchers interact with search result pages, that places even more emphasis on how your site is designed and how your page looks than ever before. But it is just one of several changes that have occurred over the last few weeks at the Big G, and probably not even the most important one. Google Instant created an intense debate when it launched, with some talking about the death of SEO. I think that the waters have calmed a bit, but there is no doubt that even simple metrics such as which search engine is getting the most searches is now harder to calculate on an level playing field, because you could argue that Google counts a search query with every letter typed into the search box. But I am more concerned about how the change affects search marketers, and the jury is very much out. Pundits are still debating what searcher behavior changes result from Google Instant. I've read that Google Instant encourages more long tail queries. I've read that Google Instant encourages more popular queries. Maybe both are true and the middle ground keywords are getting squeezed out, but I suspect that we really don't know what searcher behavior changes are here to stay. We'll need a lot more work on this and it could be that searchers themselves are still adjusting their behaviors to Google Instant and we don't know where that will lead. But, for all the attention that these changes have rightly received, I think the biggest change surrounds local search. It is possible that as many as one in five search queries now receives a page full of local results that have completely replaced the previous organic results with what was once called the seven-pack—those short results that were listed next to a map above the old organic results. Now, these local results are completely integrated into the page, creating a whole new set of winners and losers for perhaps 20% of all search queries. Maybe it's just me, but can you imagine the ruckus if Google made an algorithm change that completely upended the search results for 20% of search queries? There would be demands for government investigations, a spate of articles about how Google really is evil, laments from SEOs about how their business has been cratered, but folks, this is exactly what has happened. A huge swath of search results have been completely remade, and I don't think the old ways are ever coming back. So what's a search marketer to do? Continue to focus on what is important to searchers, whether Google rewards it at the moment or not. If you invested in good design because it was the right thing to do, Google Preview will reward you. If you focused on keyword research to make sure you know what your customers want, Google Instant might be a blip on your radar. If you optimized your Place Page months ago and focused on letting customers know where your physical locations are, then the new local search results should only help you. This shouldn't be news. After all, if you knew that videos and blogs were good for customers, and you went ahead and did them, you were laughing all the way to the bank when Universal Search was unveiled. And if you knew that investing in a faster site was good for customers, imagine your happy face when Google began factoring speed into the algorithm. At every point, it pays to do what is right for your customers even before Google rewards it. That's a lot smarter strategy than waiting until Google changes the game and then scrambling to catch up. To me, the best way to keep up with Google is to continually focus on what your customers need, and then let Google eventually catch up to you. Thanks for the post. I am very interested in the new Google Preview. Google stresses so much on original content and uniqueness for SEO purpose, but the new Google Preview is heavily based on "Design" and "Looks". It will be interesting to see how it impacts people search. Does the viewer still click on the #1 spot 75% of the time, or will this drop due to the design of the site. Maybe just by having your site in the first 10 listings as well as a good design, will increase your CTR. In contrast, us Internet Marketers notice these things, but does the average searcher? I ask people how they like the new Google (Google Instant), and most people respond with..."I thought something seemed weird when I typed into Google the other day". Sometimes, we just have to step back and not look so close at the changes Google's currently making. So how can google even measure the design f a page. We know its qualitative and does anyone know of any standard they might be using? I don't know that Google is measuring the design, just that any preview of the page means that your design has an impact as to whether searchers click on your page in the search results. Yay for preview. I remember wandering if and when this was going to happen a few years ago. I feel like its beneficial to the type of sites i typically create and will hopefully cause users to navigate towards well designed pages as they catch on. In most of the niches i work in as an affiliate, design tends to be terrible and irrelevant terms often push cookie cutter sales type ranking pages.